The stage musical version of Rock of Ages holds a special place in my heart; I got to see it the day after my final thesis presentation, a day which I had been preparing for and anticipating for months. For me, that day was one day of no stress, no worries and no problems (that all ended again that evening when my cats knocked over a glass of water over my laptop… hello again, stress, worries and problems). Rock of Ages was the prefect musical to go watch; it’s hilarious, sing-a-long-able and so over-the-top silly. Sadly the movie version is lacking a lot of what made the stage version so great. 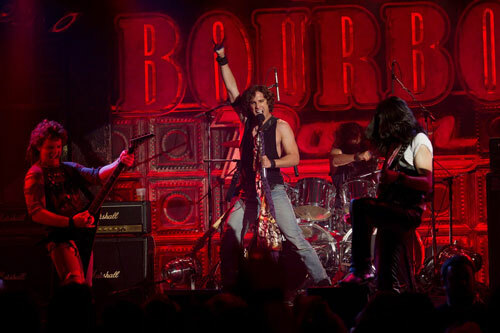 Rock of Ages is about small town girl Sherrie (Julianne Hough) who moves to L.A. to become a singer. After getting robbed the moment she arrives, she meets Drew (Diego Boneta), a fellow wanna-be singer, who works at The Bourbon Room, a popular night club. Drew helps Sherrie to convince his bosses, Dennis Dupree (Alec Baldwin) and Lonny (Russell Brand), to give her a job as a waitress. Dennis and Lonny are preparing the club for rockband Arsenal’s last performance, hoping that the popularity of its lead singer Stacee Jaxx (Tom Cruise) will help them save the club from unpaid taxes. Meanwhile, Mayor Mike Whitman (Bryan Cranston) and his wife Patricia Whitman (Catherine Zeta-Jones) want to clean up the city and shut the Bourbon Room down. As you already might suspect, I can’t review this movie without considering and comparing it to the stage musical (just as you would also compare a movie based on a book with its source material). I loved the stage version too much to completely ignore it here, and the movie is quite disappointing when you know what it was based on. 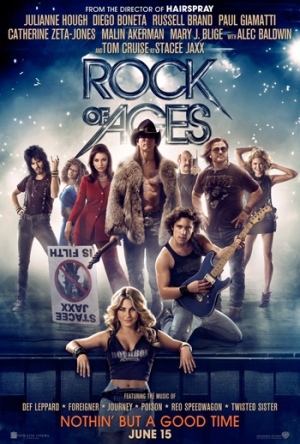 My main disappointment with Rock of Ages is how funny it is. The stage version is so hilariously funny, and almost ALL those jokes have been removed. And replaced with a monkey. I think I laughed maybe once or twice, while with the stage one I was laughing constantly. The stage Rock of Ages was very tongue-in-cheek and made a lot of fun about the fact that it was a musical. The movie version sometimes reaches that tongue-in-cheekness, but still takes itself too seriously, especially with how it deals with the budding romance between Drew and Sherrie. The movie also replaces the main two villains. In the stage version it’s German father and son architects, Frantz and Hertz, who have to deal with protester, Regina (who has been completely left out of the movie). In the movie version, it’s the mayor and his wife. I can understand why they rewrote this, but for me it just somehow didn’t work. By adding them, they also had to shift around some of their songs, which now completely don’t make sense. Especially Hit Me With Your Best Shot, which normally is sung by Frantz to his father, is now sung by the mayor’s wife to… I’m not really sure, a portrait of Stacee Jaxx? That’s not the only song that doesn’t work. A lot of the songs are taken out of the context they had in the stage version, making them feel almost randomly chosen. The one I’m most annoyed about is Don’t Stop Believing. In the movie version, it’s the song that Drew is writing about Sherrie and early on in the movie you already hear snippets of it before it’s grand finale (of course). It’s overused and done before. The stage version knows that though and practically makes fun of it. Throughout the musical little hints are given that the song is about to come, and when it finally does you realize they’ve been dropping breadcrumbs the entire time, adapting the characters to the song (for instance, Drew each time mentions he’s from Detroit, Michigan and when that line is finally sung, they also stick “Michigan” behind it). Another good example is the opening song “Sister Christian”: why the hell in the movie is that sung by the entire bus? In the stage musical, it’s sung by Sherrie and her parents, whose last name is btw Christian… then the lyrics make waaaay more sense. I was also disappointed that they cut the longer versions of “We Built This City” and “We’re Not Gonna Take It”; those were two of my favourites! Acting and singing wise I wasn’t disappointed. Even the actors that usually don’t sing, didn’t completely embarrass themselves in that awkward Pierce Brosnan way. Julianne Hough and Diego Boneta are great as our two leads, and they handle the songs great. I just wish their on-screen romance was a bit more over-the-top like in the stage version. That’s mainly though cause there Lonny is constantly narrating it and telling us about their troubles. Lonny has the most awesome one-liners and I wish they had expanded Russell Brand’s role to give us the Lonny from the stage version. Alec Baldwin is okayish as the ageing club-owner, but I feel as if he wasn’t the best person for the role. I loved Tom Cruise as Stacee Jaxx, and while his singing isn’t the best of the cast, it’s much better than what I expected from him. Stacee Jaxx’s character and storyline is much more likable than in the stage version, but I guess that was to be expected with Tom Cruise producing this. In short, my review is: if you can see the stage musical, go see it cause it’s so much funnier than the movie (you can find tickets here). The movie is enjoyable, and the songs are great, but they just don’t make as much sense as in the stage version. It’s still a lot of fun though, I just wish it had been better.